Why two-for-one? Because our recipe actually makes two different kinds of tortilla spirals--one flavored with curry powder, the other with garlic and herbs. In a small bowl, combine mayonnaise and curry powder; set aside. In another small bowl, combine semisoft cheese and milk; set aside. Spread three tortillas with the mayonnaise mixture. Spread remaining three tortillas with the cheese mixture. Arrange chicken (or desired meat) over each tortilla. Top with pepper strips and fresh basil, arranging basil leaves 1 to 2 inches apart. Tightly roll each tortilla into a spiral. Wrap in plastic wrap. Chill for 4 to 24 hours. To serve, remove the plastic wrap. Trim ends from the tortillas. 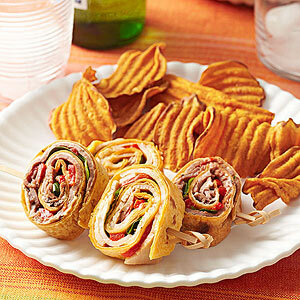 Slice rolls diagonally into 3/4- to 1-inch slices.